Reprint. Independent reading 11. Originally published: 2018. A beautifully illustrated retelling of this favourite African tale. 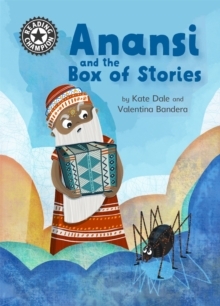 Anansi the spider is a trickster and he will stop at nothing to get Nyame's story box, proving that even the littlest among us can achieve the greatest things. Reading Champion offers independent reading books for children to practise and reinforce their developing reading skills. Fantastic, original stories are accompanied by engaging artwork and a reading activity.